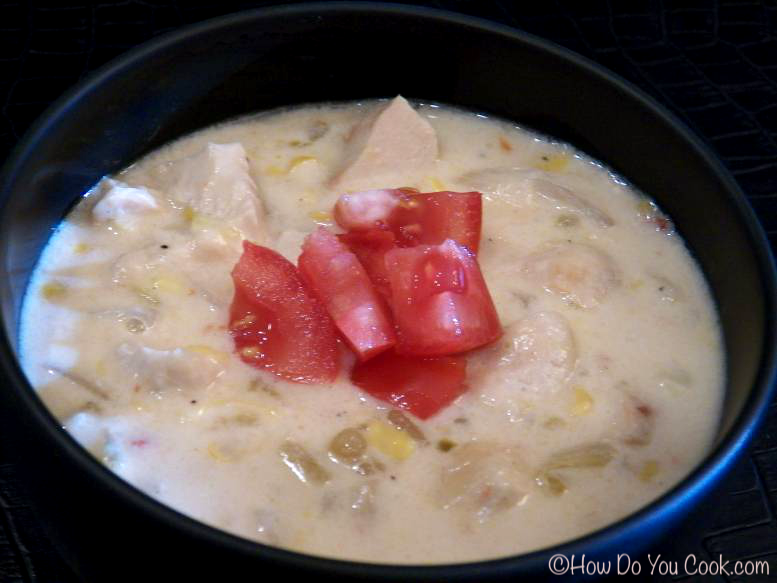 For day 21 of Soup Month 2012, we have a quick and easy soup that's made with precooked chicken, so you can have dinner on the table fast. We used some leftover chicken breast from a batch of Garlic Chicken Caesar Salads and it worked great. The chicken had been sauteed in garlic and olive, so the flavors in the chicken only added to this soup. Chicken Corn Chowder is a fairly common soup, but it usually has potatoes in it. For this soup we skipped the potatoes and ramped up the flavor by adding chipotle peppers, including the adobo sauce and a can of chopped green chilies. The combination of peppers gave this soup an amazing flavor. Prep time for this soup is super fast. Just chop up the chicken and some onion and you're ready to go. The chipotle peppers usually come in a small can packed with the adobo sauce. For this recipe use 1-1/2 teaspoons of the sauce in the soup, then you can either chop one chipotle pepper and add it to the soup or puree all of the peppers (there are about 4 per can) and use the 1-1/2 teaspoons for the soup and save the rest in a glass jar. I use a small Magic Bullet cup to do this and it only takes a few seconds to puree the peppers. Plus, having the puree in your refrigerator will give you a chance to try the peppers in other dishes. Add a bit of the puree to everything from scrambled eggs, to mashed potatoes, to chicken salad and soups of all kinds. Chipotles are an inexpensive way to add amazing flavor to your cooking. This was a great bowl of soup for a chilly fall evening and I hope you enjoy it as much as we did. Enjoy!! In a medium soup pot, melt butter over medium-high heat. Add onion and garlic and saute for 3 minutes. Add the cooked chicken, salt, pepper and corn, stir and cook for 3 minutes longer. Add the chicken broth, half and half, chipotle pepper and adobo sauce to the pot. Stir and bring mixture to a low boil. Reduce heat to medium-low, add the pepper cheese and stir to combine until the cheese has melted into the soup. Cook at a low simmer for 10 minutes, or until the cheese is fully melted. Ladle the soup into bowls and garnish with diced fresh tomato. Serves about 6.